I have been totally fascinated by watching a Weasel that lives here. Two days in a row he kept popping out of a spot near one corral where Frank was dropping in a hay bale. I checked the spot but could find no den. I was looking for weasel on the third day, but he did not appear. Then I looked at the bobcat skid steer and who’s head do I see in a small hole in the side ? Weasel ! He was riding in the Bobcat doing chores. Patrick got his photo while he was here. A lot of migration and a lot of nest building going on. I have been watching two improve on this existing nest. This one swoops in to steal some of the material. You never know what happens while you are away do you. Earlier in the week I only saw a handful in formation. It has been several cold months since I heave heard their voices. Made me happy. They are all basically headed Northwest towards the Missouri river it seems. Yesterday the numbers have increased with flocks of several hundreds moving at a rapid pace. Several flocks in the air at once. The Northern plains and it’s great openness allows you to be a visual witness. Then last night they were heard but not seen passing overhead. Many calling in the darkness as they passed overhead. You could almost feel the movement. Freezing fog in one large brush stroke paints the entire scene with frost. Happy Holidays to everyone, everybody, and everything ! Long Lake National Wildlife Refuge. 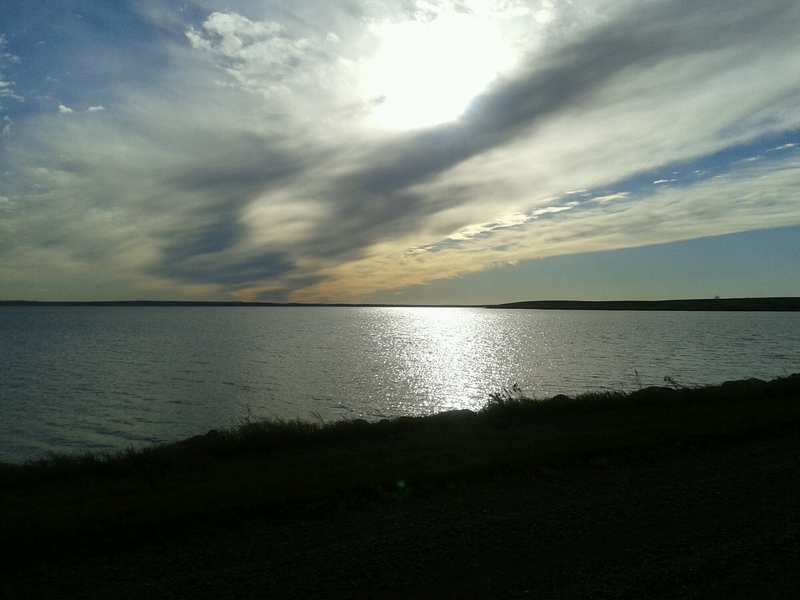 Near Moffit, North Dakota. Saw tens of thousands of geese in the air last evening. Western Grebes in the lake, hundreds of Sandhill Cranes in formation headed South. I would often hear the very distinctive sound of the tail slap a beaver makes as it dives under water at night while camped for the evening. This one I was thrilled to watch at the James Kipp Recreation Area in Montana.